Among the NHL teams with the top five average asking prices on the secondary market, two experienced significant price drops between the start of the season and the midway point, and one has experienced a nearly 20% jump in average asking price. All of the moves are tied to the teams’ success – or failure – on the ice. For the teams at the bottom of the average asking price pile, only the Vancouver Canucks experienced a double-digit drop in price rankings since the start of the season. The reason? The Canucks started the season atop the Pacific Division, but have since struggled on defense and now are on the bubble to get a wild-card bid to the playoffs. As the season moves into the second half, here’s a look at how prices have moved among the top five and bottom five average asking prices in the NHL. 1. Toronto Maple Leafs: Toronto started the season ranked No. 1 in the NHL in terms of average asking price on the secondary market, according to secondary ticket marketplace TicketIQ.com, and little has changed. Maple Leafs’ tickets have fallen 2% from $332 at the start of the season to $325 at the halfway point, but as the only team with an average asking price above $300, the drop hasn’t affected their ranking. The Leafs have made it to the playoffs both of the last two seasons, and are among the top teams in the Eastern Conference. 2. 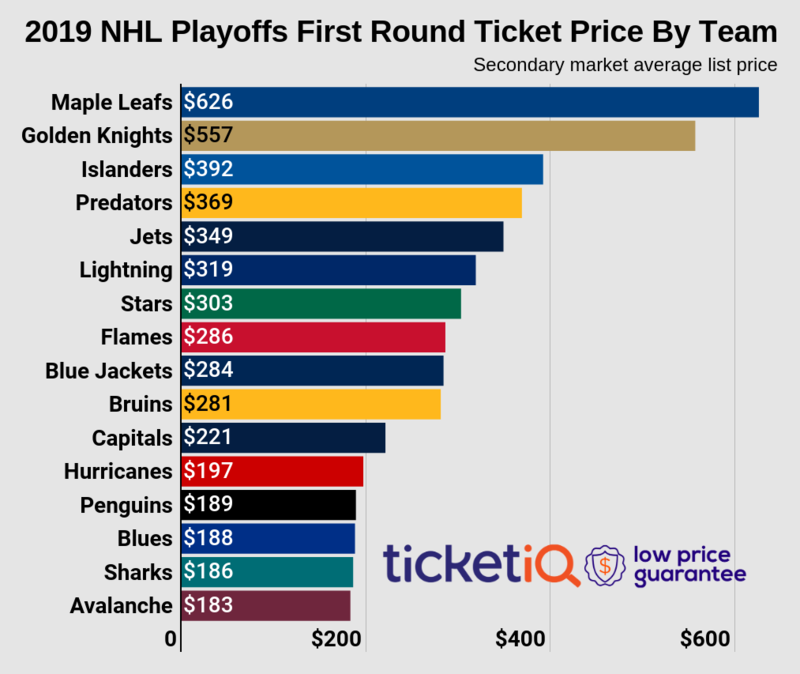 New York Rangers: To say that Rangers’ tickets have fallen in price is a bit of an exaggeration – the average asking price is $2 less than it was at the start of the season, amounting to a less than 1% fall. Even with that slight fluctuation, the Rangers have moved up two spots in the price rankings, from No. 4 at the start of the season to No. 2 by the halfway point. The Rangers are playing .500 hockey, but are currently out of the wild-card race in the tightly packed and competitive Eastern Conference. 3. Boston Bruins: The only other team in the Top 5 besides the Rangers to make a move up in the rankings, the Bruins' on-ice product has pushed average asking prices up nearly 17%, according to TicketIQ.com. Boston, which won the Stanley Cup in 2010-11, and got to the second round of the playoffs last season, were ranked No. 5 at the start of the season, but moved up to the No. 3 spot. The average asking price jumped from $184 to $215 during the first half of the season. Boston is at the top of the wild-card race. 4. Winnipeg Jets: Since the start of the season, tickets to a Jets game dropped nearly 24%, but since they started as the third most expensive in the league, that’s not enough to take them out of the top five. At the start of the season, fans paid an average of $269 in the early going, but as Winnipeg has cooled, demand has pushed prices down to $205, good for No. 4 in the league at the halfway point. The Jets got to the conference finals against the upstart Vegas Golden Knights last season, and were in first place in the Central Division as of February 7th. 5. Vegas Golden Knights: Last year’s Cinderella team, the Golden Knights became the first North American professional sports team to make it to a league championship in history. Their second second season hasn’t been quite so compelling, though the Knights were in third place in the Pacific Division as of February 7th. The average asking price for a Vegas ticket dropped nearly 27% in the first half, from $271 to $199, and their price rank fell accordingly, from No. 2 to No. 5. 1. Arizona Coyotes: In last place in terms of average asking price at the start of the season, Arizona tickets fell 8% during the first half, from $72 to $66. The Coyotes were still the cheapest ticket in the NHL at the halfway mark, and were in the bottom half of the Western Conference. 2. Vancouver Canucks: The biggest mover in terms of price across the league after a disappointing start, Canucks tickets dropped just over 51% from the start of the season to the halfway point. Vancouver dropped 15 spots, from being ranked No. 15 in terms of price to No. 30, as the average asking price slid from $140 to $68. Currently, the Canucks are second in the Wild Card race. 3. Carolina Hurricanes: Another team that experienced a big slide in the first half, the Hurricanes were ranked No. 21 in terms of average asking price at the start of the season, but dropped to No. 29, a nearly 41% decline. At the start of the season, fans drove the average asking price to $125, but as of January 14, it cost an average of $74 to see a game. Credit the fall to inconsistency – the Hurricanes started off hot, then lost eight of 10 and had a five-game losing streak in November. 4. Anaheim Ducks: Among the bottom five teams, the Ducks have had the least volatility in average asking price. Anaheim started the season with a $79 average asking price, which was down a $1 to $78 at the halfway point, for a drop of just over 1%. Even with the slight drop, the Ducks moved up two spots to No. 28 in average asking price during the first half. 5. St. Louis Blues: Usually a team with committed fans, the Blues are playing .500 hockey, and fans don't seem willing to pay top dollar for tickets. The average asking price for a ticket to a St. Louis game dropped nearly 29% in the first half, from $119 to $85. St. Louis started the season ranked No. 22 in terms of ticket of price, but at the halfway point were ranked No. 27. 1. Columbus Blue Jackets: The Blue Jackets are winning – on the ice and at the box office. Columbus had the biggest price increase on the secondary market between the start of the NHL season and the midway point, as the average asking price jumped nearly 27% from $126 to $160. That was good enough for Columbus to move up 12 spots in the priciest ticket standings, from No. 20 to No. 8. 2. New York Islanders: Another team that jumped up 12 spots in the priciest ticket standings, the average asking price for an Islanders ticket is up 25.5% in the first half. New York tickets started the season at $102 and were up to $128 by the halfway point. The Islanders moved from No. 26 in the rankings to No. 14. 3. Boston Bruins: Boston started the season in the Top 10 in terms of average asking price, but moved up two spots by the halfway point on a nearly 17% price increase. At the start of the season, the average asking price for a Bruins ticket was $184, and it was up to $215 by January 14. The Bruins now rank No. 3 in in the league in terms of average asking price. 4. Detroit Red Wings: Detroit also started the season among the Top 10 in price, and it jumped to No. 6 on an average asking price increase of nearly 8%. The Red Wings started the season with an average asking price of $158, and fans were paying an average of $170 by the midway point. 5. Pittsburgh Penguins: Pittsburgh fans continue to drive prices up – from $131 at the beginning of the season to $137 by January 14. That’s a jump of nearly 5%, which moves the Penguins four spots up the average asking-price rankings from No. 17 to No. 13. 1. Vancouver Canucks: The biggest mover in terms of price across the NHL, Canucks tickets fell just over 51% in the first half. Ranked No. 15 in terms of average asking price at the start of the season, Vancouver tickets have dropped from $140 to $68, making them the cheapest ticket in the league. That 15-spot move is the biggest in the league as well – two teams moved up 12 spots with price increases. 2. Carolina Hurricanes: The Hurricanes’ $125 average asking price at the start of the season was good enough for a No. 21 ranking in terms of price. But by the halfway point, that price was down nearly 41% to $74, making a Carolina ticket the second cheapest in the NHL. Carolina dropped eight spots in the average asking price rankings, and is one of only a handful of teams with an average asking price under $100. 3. St. Louis Blues: With a decline in ticket prices of nearly 29%, the St. Louis Blues tumbled five spots in the NHL’s price rankings, from No. 22 at the start of the season to No. 27 by the halfway point. Blues tickets averaged $119 on the secondary market at the beginning of the season, but as of January 14 were $85. 4. Colorado Avalanche: While still above the $100 mark, the average asking price for an Avalanche ticket has dropped nearly 27% from $145 to $106 since the start of the season. The drop moved Colorado from No. 12 in the average asking price rankings to No. 18. 5. Vegas Golden Knights: Last season’s darlings still have one of the priciest tickets in the NHL, but suffered a nearly 27% decline in average asking price during the first half. The Golden Knights started the season with a $271 average asking price and were ranked No. 2 across the league. Four months later, the average asking price is $199 and the team is ranked No. 5.